Among Laura Lee Mullin’s most memorable runs was the one that happened before she was married, when she brought her future husband Robert along for what she described as a test run. They had been dating just a few months and decided to go for a 5km jog together when Laura Lee, fuelled by her ‘competitive spirit,’ decided to take Robert on a little loop. This story ran in the July 2 edition of the Daily Gleaner. One of the newest faces on the Fredericton running scene made a quick impression at the Salmon Run 5km event last weekend, winning the inaugural race in the 65-person field in a solid time of 19:48. We have a big week next week as activity rises significantly for the 2015 Marathon by the Sea in Saint John, beginning Friday and lasting through Sunday. Record numbers are expected. As was the case last year, we have five profiles in the final week, including two more Running Whys, a Running Hows, a Running Whys recap with comments from friends and family of the people we profiled this year and a special look back at the 2014 edition of the race – the 20th anniversary edition of MBTS. In addition, we will have another profile on a Fredericton area runner that will run in the Daily Gleaner on Aug. 9. Hope you come back for the stories. Here is who we profiled for Marathon by the Sea in 2015: Carol Lynn Landry, Donald and Elspeth Lemon, Carolyn Radcliffe, Andrew Estey, Corinne Fournier, Kevin McEachern, Sherri Colwell-McCavour, Jesse Davidson, Jason Kaulbach, Jacqueline Boucher, Jen Payne, Mark Clinton, Patty MacMillan, Haley Adams-Green, Dean Mercer, Caitlin Stevens-Kelly, Carla Harris, Dave Horgan, and Krista Sutton. Here is a look back at last year’s race. When things wrap up Sunday, we will touch base with our runners and get some perspective on their 2015 experiences. 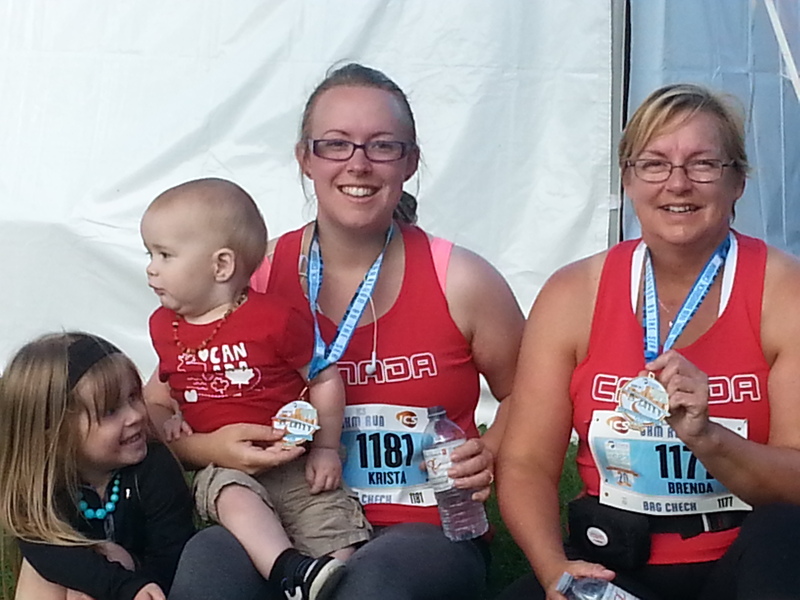 Krista Sutton, centre, celebrates after completing the 5-km race at the 2014 Emera Marathon by the Sea with her children and her mother Brenda. When participants in the 2014 Emera Marathon by the Sea crossed the finish line in their respective events last August, many were delighted to complete a major goal. The experience proved especially meaningful for one Saint John runner, who used the 20th anniversary race and corresponding salute to the fallen RCMP officers as motivational fuel to launch her personal wellness journey. This year, Krista Sutton is back and is sharing her incredible story of recovery that started almost 18 months ago. 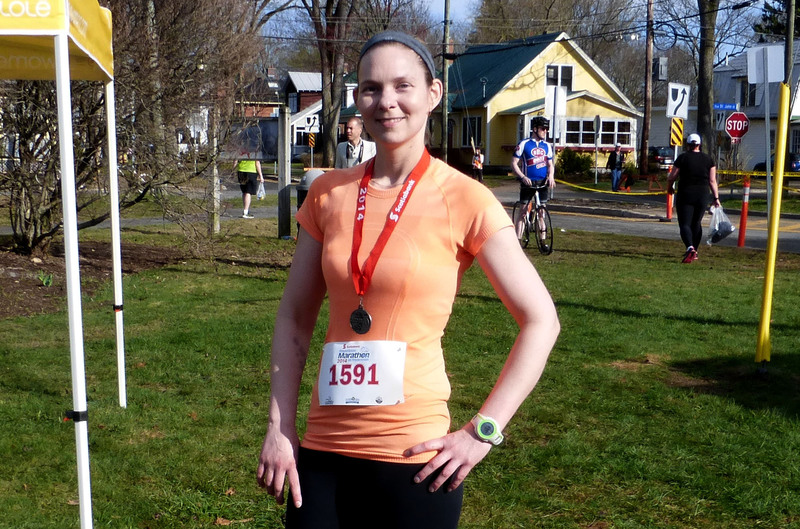 Her account is the first installment in our 2015 Running Whys series for the 2015 Emera Marathon by the Sea. I wasn’t always a runner. Jerrilyn Bramble, shown in this photo after the Fredericton Marathon 5k this year where she ran a personal best, is looking forward to returning to the road racing scene after she recovers from her second surgery in less than a year. Here is the latest edition of The Running Whys series that ran in the Daily Gleaner this week. It features Jerrilyn Bramble, who despite significant challenges, managed to compete in two races between a pair of recent surgeries and is eager to get back into the road racing scene, possibly as early as December. Here is a Q&A with her that set up the story in the Gleaner. Enjoy. 1. First, tell me a bit of your background. Where are you from, what do you do for a living? 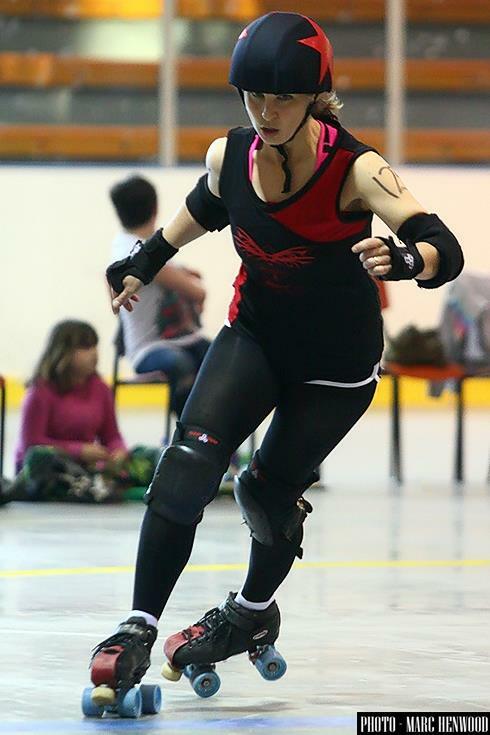 Running has helped Kâté Braydon with many of her activities, including Roller Derby, where she is a member of the Fog City Rollers’ Shipyard Sirens. Photo: Marc Henwood. Editor’s note: You may recognize Kâté Braydon from her award-winning career as a photojournalist, which lands her in many parts of the greater Saint John area with her camera in tow. You also might know her as Josey Ramoan of the Fog City Rollers’ Shipyard Sirens of the Saint John Roller Derby League (That is her pictured in a photo courtesy of Marc Henwood). And you may have seen her running to keep fit, get ready for a race or prepare for Roller Derby. For Kâté, running and fitness are important components of her life these days, aspects she fought to incorporate into her daily routine. What follows is her story about the path to this year’s Marathon by the Sea and the Goodlife 12 k event on August 10. This is the 14th story in a series profiling runners who will compete in the 20th anniversary running of Emera Marathon By the Sea Marathon in Saint John. The stories are also running on the MBTS Facebook page and MBTS website. I have been trying to be ‘a runner’ for what feels like my entire life. Or at least since I hit puberty, ate too many chocolate chip cookies and gained about 15 pounds. The first week of training served notice that yup, I am actually doing this. Time for a deep breath. The running total was 43k (in eight days mind you), with three 10k runs in there. Nothing that fast or slow, just average pace. Still feeling the impact from the flu bug now two weeks old and it was tough to get going all week as I felt worn out. Not encouraging considering what lies ahead but it is something I believe to be short term. It was reflected in my 5k time in a race at our school Sunday – 26:35. I did accomplish a dubious first though – missing the start of the race. There were several races that day for the kids – one 500 metres, another just over 1k. When the longer one was finished and my daughters celebrated their runs with a medal and a tasty Popsicle, I thought it was safe to run to the facilities. When I got back, the crowd looked more sparse than I had remembered. Avery, seeing me there, frantically says, ‘They have already gone, get going.’ I did not believe it but yup, the race directors confirmed the race was about 2 minutes old. Not a great way to get underway but a good lesson learned. I was able to catch a few of the runners ahead and considering the remnants of the flu or the small chest cold I was still dealing with, the overall outing was not that bad. It rained most of the weekend, broke in time for the race and then rained again in the afternoon, so the timing worked out well for organizers. Last week – 5 runs, 43 ks. This week – 5 runs, 50 k, including one long run of 14k.